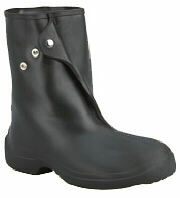 Economical molded overshoes that are reliable and practical. Stretchable compounding makes it easier to pull these boots on and off. Extra thick for durability and pliable for comfort, these molded overshoes have proven their value year after year. Resists animal fats, petroleum, oils, grease and barnyard acids. 10" in height. When sizing for boots designed to be worn over another shoe, choose a size 2 sizes larger than your regular shoe size. For sock-only wear boots, use your regular shoe size. Because boots do not come in half sizes, you may have to experiment with socks of varying thickness or layers of socks to find the perfect fit.